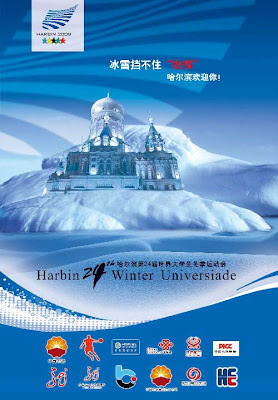 What's happening in China at the 24th Winter Universiade. Remember I gave instructions on how to find the results - see here. Anyway, John Hamilton's GB team lost in an extra end to Canada earlier today and currently sit on a 1-3 win-loss record. Sarah Reid's side beat the Russians and are on 2-2. There's some more about the Universiade in the Curling News blog here (I like the photo, I believe kit like this is being considered for next season's RCCC Regional Academy athletes!) where you can read the following words: "Hats off to FISU for organizing a great competition. Scotland’s Jeannette Johnson (sic) and her Chinese organizing committee have done an outstanding job covering all the bases. The best decision they have made was bringing in icemakers Scott Henderson and Doug Wright... conditions have been amazing and continue to impress all of the teams." BLOG INFO: Don't be looking here for anything from Perth until later tonight. I'm off to greet our two young GB teams back from the EYOF with their medals! The results from the Bruadar and Columba Cream Championships can be followed on the RCCC website.